Architect: Kevin Toukoumidis and Tom Hagerty, DSPACE Studio LTD.
Home Builder: Jeffery Berry, GGC, Inc. 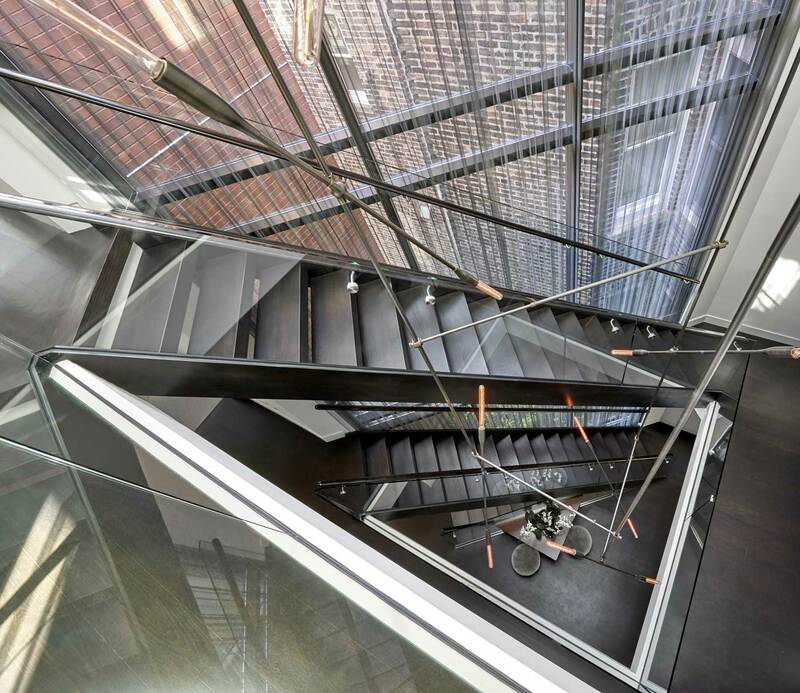 The result of the extensive revamp and third-floor addition is a home distinguished by a light-filled center atrium with an open steel staircase that runs alongside a soaring diagonal wall. “The footprint of this house steps back, and, in lieu of square footage, we created bigger windows that allow for more natural light,” explains Toukoumidis. 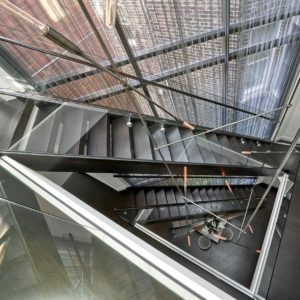 To create a sense of privacy, Hickman designed a custom sheer drape with a motorized control for the three-story window. “All of the surfaces were a bit hard and slick,” Hickman says. “I felt that we needed a sheer drapery wall to make the house feel less stark. It’s like fabric architecture.” A custom bronze-and-glass chandelier that’s suspended from the skylight adds yet another layer to the ensemble. “The fixture really draws your eye upward,” says project architect Tom Hagerty. It was Hagerty’s idea to conserve valuable floor space by using a thin sheet of frosted glass rather than drywall for the partition between the hallway and the master bathroom on the third-floor addition. The master bathroom receives natural light from a skylight above the sculptural tub during the day, and at night, the wall itself appears to glow thanks to concealed LED lights. “The clients love the added space and light,” Hagerty says. Adding the third story, however, required extensive retrofitting of the original structure. “We drilled into the concrete block with an epoxy injection bolt that melds the interior block with the outer brick,” says Berry. According to the builder, the foundation footings weren’t strong enough to handle the load of the third-story addition, so the team dug down and added mass to them. 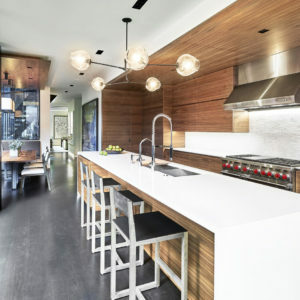 To create a sense of continuity, the team employed a limited palette of materials that includes blackened steel, white quartz and walnut—which was used to build the custom cabinetry in the living room and to create the ceiling panels that define the kitchen and dining room. 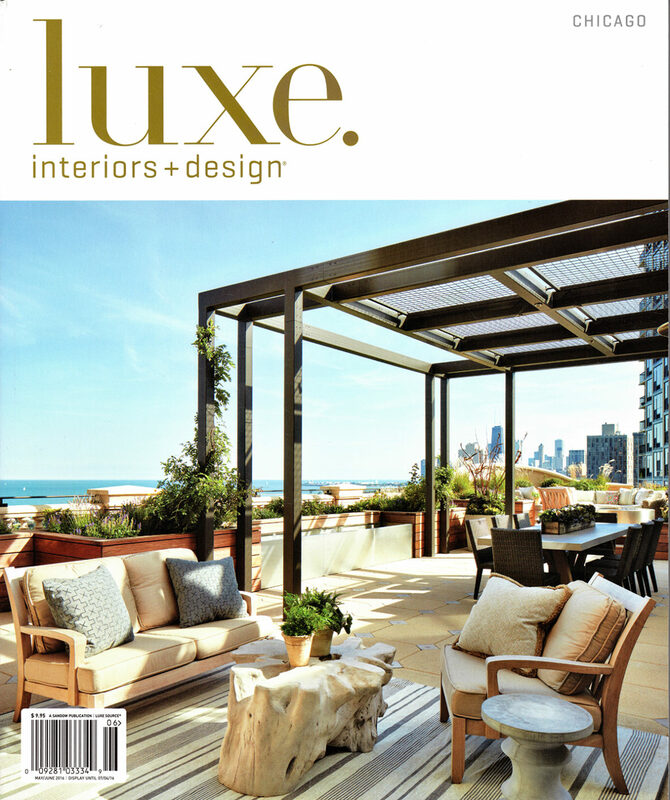 “The edited material palette allows for a cohesiveness throughout the home and provides a calming environment that highlights the architecture,” says Toukoumidis. That playful dance of influences continues in the dining room, where sculptural chairs contrast with the light fixture’s rectilinear lines and a leather-padded wall behind the custom bench. 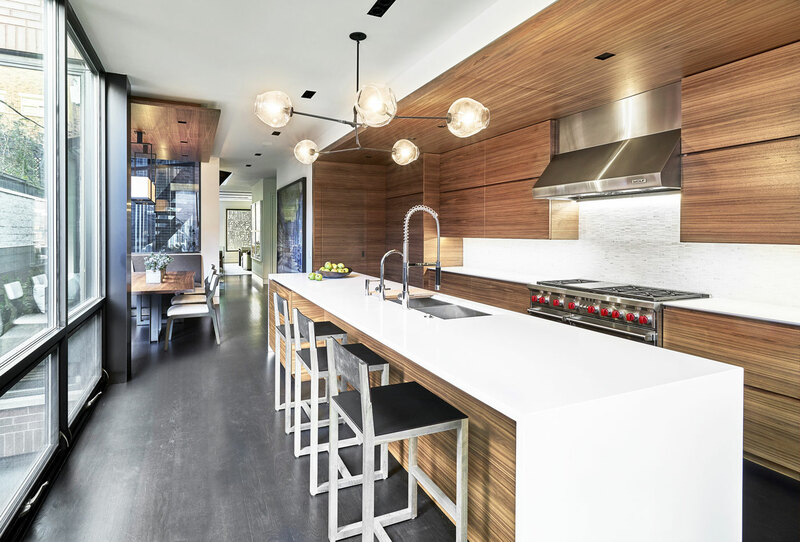 “The organic shape of the chairs ties in with the kitchen’s chandelier, too,” says Hickman, pointing to the shapely fixture hanging over the white-quartz island. “I really pushed for this fixture because it broke up the rectilinear cabinetry.” Furthermore, a pair of glass pendants adds an elegant touch to the master bedroom—a lively, welcoming retreat with an upholstered headboard, alpaca-hide rug and bench re-covered in a sumptuous shearling. “The bench’s legs are a fun shape against the more angular lines in the bedroom,” Hickman says. According to the designer, being in the bedroom looking out over the garden and through the leaves feels like being in a tree house. Although the home is sandwiched between two three-story structures, a trio of tall European beech trees planted just outside the kitchen window helps to break up the brick views. “Screening views in the city is always a challenge,” says landscape architect Mimi McKay. “So, to create privacy, we added in trees to conceal the sight of their neighbor’s property.” Moreover, the approach from the front walk is equally as appealing, especially during the evenings. When the entry foyer and garden are illuminated, the home appears to glow from within. “From the front sidewalk you can see all the way through the house, which is very inviting,” Toukoumidis says. 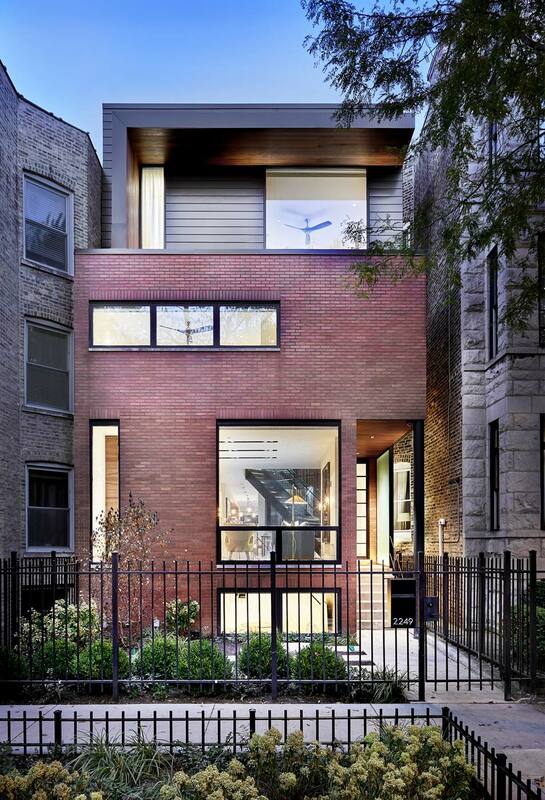 Overall, the home came together with perfect precision, thanks to input from the homeowners. “Working with clients who are so appreciative of good design was very rewarding,” adds Toukoumidis. Mission accomplished.